During the last few decades, lottery tickets have become an increasingly popular form of legal gambling in the United States. One popular game is the instant win, or scratch off lottery which features tickets that have the winning (or losing) numbers concealed on the game card itself. The winning numbers are typically hidden by a coating, which is removed by rubbing. By removing this coating, the owner of the ticket can instantly determine the ticket's winning status instead of waiting for a matching number to be drawn. Since the cash value of the ticket is determined at the time of printing, the tickets must be designed and manufactured with extraordinary security precautions to avoid ticket fraud. The design of instant lottery tickets varies from game to game. To entice potential purchasers, games may be thematically linked to popular interests such as sporting events, television shows, or even other gambling games like poker card or horse racing. Some states have even allowed customers to participate in the design process. For example, in 1993, the Oregon State Lottery held a "Designer Scratch-it Contest" for the general public. Winners were judged based on theme, style of play, graphics, and originality. Regardless of the design type, instant lottery tickets are designed to be played by scratching off a concealing coating to reveal numbers, letters, or symbols that will (hopefully) match the designated winning symbol located somewhere on the ticket. These games are all designed with multiple security features to prevent tickets from being counterfeited or tampered with. There are several techniques used to breach game security, which must be taken into consideration during the design process. One method of defrauding the lottery is to decode the relationship between the serial number on the ticket and the ticket's lottery number. Each ticket contains an individual serial number composed of a series of digits or alphanumeric characters. This number is used by the game operator to track the distribution of tickets from the operator to the selling agents and for accounting of sold and unsold tickets. It may also include information that shows the ticket is only valid for certain games or dates. These numbers are especially helpful in case tickets are lost or stolen and can be used to track tickets to make sure they are not inappropriately claimed. By understanding the relationship between the serial number and the lottery number, one could try to locate lots or batches of tickets that are more likely to be winners. Other methods to breach ticket security attempt to directly view the lottery number without scratching off the ticket covering. One way this is done is by candling, which involves shining a bright light on the ticket in an effort to read the lottery number through either the front or back covering. Another technique, known as delamination, involves separating the different layers of the ticket to make the numbers visible. This technique can even be used after the owner has uncovered a winning number and turned in the ticket for redemption. In this scenario, individuals with access to winning tickets could separate the front layer of the ticket that contains the winning number and glue it onto a new back layer that has a different name and address for the winner. Still another way of circumventing lottery security, called wicking, uses solvents (e.g., alcohols, ketones, acetate, or esters) to force the lottery number to bleed through the concealing coating. The design features employed to prevent these security breaches vary from game to game. In general, these features involve the serial number and the concealing coating. One key to controlling game security is to select serial numbers, which do not reveal any information about the winning status of the ticket. This is done by randomly encoding tickets with a series of computer-generated numbers or symbols. Each lottery game uses a specific algorithm, or mathematical process, to randomize the relationship between the serial and lottery numbers. This prevents anyone from discovering the connection between the two numbers. When properly encoded, the serial number cannot be deciphered by the ticket purchaser but still provides useful information to the ticket agent. Printing matching, coded numbers on the front and back of each ticket can help ensure winning tickets have not been tampered with. The security features used to prevent candling, delamination, and wicking involve the coating used to conceal the lottery number. A heavy foil coating can be used over the numbers to prevent light from passing through the ticket and illuminating the numbers. However, this foil is expensive to add and it does not prevent delamination. A better way to prevent the numbers from being read through the coating is to use an opaque covering in conjunction with confusion patterns imprinted on the back and front of the ticket. These confusion patterns are random designs used to obscure the image when light is shined through the ticket. This method can also be used to prevent wicking by utilizing dyes in the coating which are responsive to solvents. If anyone attempts to dissolve the concealing coating, the ink bleeds and obscures the lottery numbers. The basic materials required for ticket manufacture are the same as those employed for any similar ticket or card printing. The main component is paper stock of appropriate stiffness, but aluminum foil is also used as a component of some multilayer tickets. Other important raw materials include the suitable inks, adhesives to laminate multi-part tickets, and the scratch-off coating materials used to conceal the number. These coatings are most often made using acrylic resins. 1 Depending on the technique employed, tickets may be printed in a single stage (where all the information is printed at once) or in two stages (where the game information and secure numbers are printed separately). Game information includes details such as ticket prices, gaming rules, validation dates, prize information, and graphics to entice the consumer. Tickets can be printed by either a continuous feed process or by a sheet press process. In the continuous feed process a strip of paper ticket stock is fed into the computer controlled printer. In the sheet press method, ticket sheets are imprinted by engraved plates. After printing, the sheets are sliced into individual tickets. These tickets are then stacked and shuffled to ensure the lottery numbers are not in consecutive order. Winning tickets are randomly intermingled so there is a wide and preferred distribution of winners. 2 Coded serial numbers and corresponding lottery numbers can be added to the tickets in several ways. The continuous printing process uses sequencers, which advance the serial number for each ticket when it passes through the press. These serial numbers go through a complex mathematical transformation (known as algorithmic conversion) to intermediate numbers, which are in a consecutive order. A second algorithmic converter operates on the intermediate number and generates the actual lottery number. In order to prevent illegal tampering of a lottery ticket, an opaque covering in conjunction with confusion patterns is imprinted on the back and front of the ticket. These confusion patterns are random designs used to obscure the image when light is shined through the ticket. to the printers transmit information on speed and relative position of individual tickets as they are being printed. The computer then generates print control signals that cause the ink jet printers to simultaneously print book numbers and lottery numbers. By printing both these numbers at the same time from opposite facing printers, the front and back of the ticket can be printed at the same time. Similarly, tickets can be printed with a single printer which has a print head located on the top and bottom of the ticket face. After the printing process is complete and both the lottery and serial numbers have been added to the cards, the lottery number can be concealed. 3 The tickets are sent through a cover applicator, which treats the ticket with one of several concealing coatings. One type of coating is an opaque metal foil, which is applied with pressure. A paper pulltab may also be used to conceal the number, although this method is not frequently used today. The preferred concealment method uses an acrylic film to cover the number. This type of coating is applied in several layers. First, the paper card surface is treated with a primer coating which prepares the surface to accept the other layers. 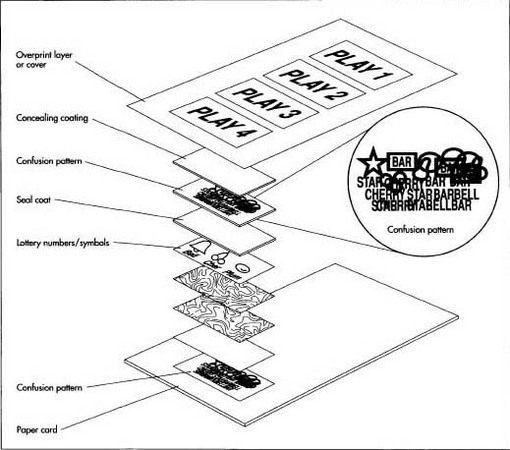 Next, a confusion pattern, consisting of random lines or symbols the same color as the lottery numbers, is printed on top of the primer coat. The lottery numbers are printed on top of this layer, and a seal coat is applied over the numbers. The uppermost concealing covering is added next. This concealing coating contains highly opaque materials such as carbon black pigment or aluminum paste mixed with acrylic resins and appropriate solvents such as methyl ethyl ketone. The resulting coating effectively hides the numbers beneath but can be easily removed by rubbing. An additional confusion pattern is printed on top of this layer. Finally, an overprint layer featuring additional graphics or instructions may be printed on top. 4 After the printing and coating processes are complete, additional converting operations may be performed on the tickets. These operations include slicing the tickets into rolls or perforating them for ease of dispensing. Finally, the tickets are boxed and readied for shipment to distributors. After delivery, the tickets are sold for use. When the ticket is purchased and the owner scratches off the covering, he or she reveals the ticket's winning status. The ticket is then taken to a ticket vendor to claim the prize, and the game operator inputs the serial number in their computer to decode it and confirm that the ticket is a winner. The ticket vendor then pays the customer and is subsequently reimbursed by the lottery operator. Printing technology is continually evolving and this evolution is likely to lead to new methods for lottery ticket production. For example, improved encryption technology could result in the creation of more secure lottery numbers. Likewise, newly developed chemical methods of concealing lottery numbers could produce less expensive tickets than those currently used. Perhaps of more interest for the future are alternate ways in which games may be played. One method under consideration by the lottery commission involves a video terminal instead of a paper ticket. It is conceivable that at some time in the future, an instant lottery game could even be played over the Internet on a personal computer. Johnson, Ben E. Getting Lucky-Answers to Nearly Every Lottery Question You Can Ask. Chicago: Bonus Books, 1994. The Lottery Collectors' Society. 1007 Lutrell St., Knoxville, TN 37917. I got a lot information from the article. Would you please tell me something on the process of prepaid telephone cards. Thankyou in advance for your response.